Yet another reason the camera has been neglected a bit lately… I decided to finally act on my desire to learn how to play guitar and on February 22nd I bought a Guild GAD30E after visiting the local guitar shop and am slowly learning how to play. While I have figured out the notes/layout of the fret board and my finger picking coming alone smoothly, I’m still working on learning chords. Interesting concept – chords, not something I’ve ever had to deal being a flute player. 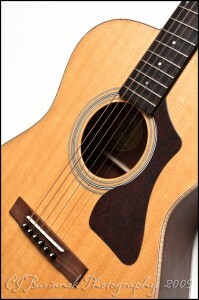 Played with the photo in Lightroom to make the new guitar look old and liked the effect of this… Below is the orginal.